I just posted my first-ever video to Facebook. Woah! 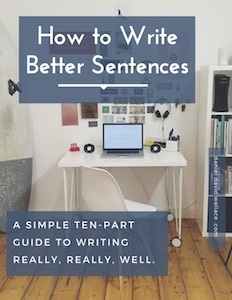 It’s a two-minute video talking about sentence construction and the “cumulative sentence.” If you liked my guide to writing better sentences, or any of my posts about grammar and style, you’ll enjoy this. Would you take a look? Please feel free to share the video wherever you think writers might like to see it. The Cumulative Sentence — in two minutes! Why did I record a video about writing? Well, on the one hand, this is something I’ve been meaning to try for a while — I have long wanted to show people, rather than just tell them, about writing processes. However, these vague thoughts of mine got a shove at the BlogHer conference, which I attended last month, in Florida. Two separate panels argued, very convincingly, that video is going to be the future on social media. One remarkable speaker stated that video, and live video in particular, is currently the best way to get your word out on Facebook. So I gave myself a simple challenge: could I teach something truly useful in a video format, in just one minute? It turned out that I needed two minutes, not one. But I think the result is good. PS If you like what you see (and hear), you should make a video like this yourself! I used no special software. I created the animated slides in Keynote, and then recorded the voiceover in iMovie with my $60 Audio-Technica microphone. Also — I am planning to post more videos on my fb page, and to do some live video sessions, too. So you should “like” my FB page in order to get alerts of future videos. Now — take a look at the video: The Cumulative Sentence — in two minutes!